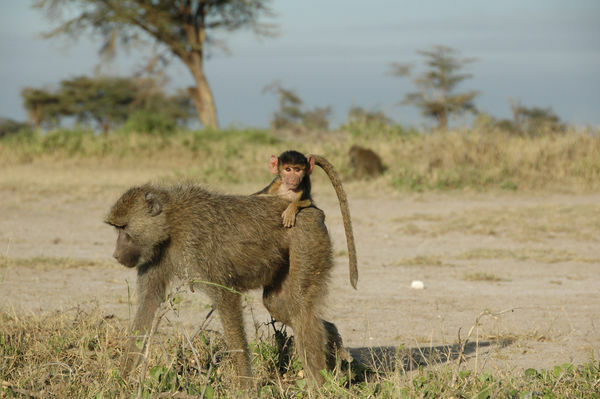 Duke University, DURHAM, N.C. — Numerous studies have shown that childhood trauma can have far-reaching effects on adult health and survival; new research finds the same is true for wild baboons. The findings, scheduled to appear online April 19 in Nature Communications, come from a long-term study of 196 wild female baboons monitored on a nearly daily basis between 1983 and 2013 near Amboseli National Park in southern Kenya.The results are important because they show that early adversity can have long-term negative effects on survival even in the absence of factors commonly evoked to explain similar patterns in humans, such as differences in smoking, drinking or medical care, said Jenny Tung, an assistant professor of evolutionary anthropology and biology at Duke who co-authored the study. Life isn’t easy for a wild baboon. Like many animals on the African savanna, baboons endure drought, overcrowding, disease and predation. For baboons, like humans, the tougher the childhood, the higher the risks of premature death later in life. Young females that experienced just one or no adverse events — a group the researchers nicknamed the “silver spoon kids” — generally lived into their late teens and early twenties, whereas those that endured three or more often died by age nine. The “bad luck” babies not only lost more than ten years off their adult lives, they also had fewer surviving offspring. “It’s like a snowball effect,” said co-author Elizabeth Archie, associate professor at the University of Notre Dame. But wild baboons don’t smoke or binge on junk food, and they don’t carry health insurance. This supports the idea that differences in lifestyle and medical care are only part of the story, said co-author Susan Alberts, professor of biology at Duke. Baboon DNA is 94 percent similar to that of humans, which indicates these patterns could be deep-rooted in primate physiology, the researchers say. “This suggests that human adult health effects from childhood stresses are not simply products of the modern environment, but have likely been present throughout our evolutionary history,” says George Gilchrist, program director in the National Science Foundation (NSF)’s Division of Environmental Biology, which funded the research. Originally published by Robin Ann Smith, Ph.D., Science Writer Duke University at globalhealth.nd.edu on April 19, 2016.